Encourage your fellow implanters to join NSUKI to increase the volume of that voice. Membership includes membership of INS and subscription to the journal Neuromodolation: Technology at the Neural Interface. The journal is fully indexed in Medline, and the Index Medicus. 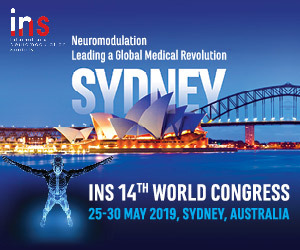 NSUKI is pleased to offer bursaries to facilitate attendance at the International Neuromodulation Society's 14th World Congress in Sydney, Australia on 25 - 30 May 2019. Each bursary would be up to a maximum amount of £3000. Attached are the bursary regulations and application form. The deadline to receive completed application is 02 January 2019. We will let you know the result of your application by 15th January 2019. The Neuromodulation Society of the UK and Ireland invited proposals for the 2017 research grant competition. Two grants of up to £2,500 were awarded for a research proposal, which may be in any field of neuromodulation research. Applications were peer reviewed and a decision made by the Neuromodulation Society of the UK and Ireland Research Committee. Dr Kavita Poply: A prospective single blind crossover design pilot study to investigate the dynamic brain imaging response to changes in frequency parameters in patients with spinal cord stimulation with intractable neuropathic pain. The funds may be used for a variety of purposes in support of a research project (e.g. small project grant, salary support, equipment purchase, running costs or additional funding to an existing grant). Applications were open to all neuromodulation researchers in the UK and Ireland (nonmember applicants will receive membership for the duration of the grant). It is expected that the result of the research will be presented at the Annual Scientific Meeting (within two years of receipt of the award).